Proudly Serving NJ, NY, DE, PA & More! We welcome an opportunity to discuss your furniture needs with you, as we can match or beat most pricing! When you’re running a business, you want your office space to be as professional as you are. This is true for many reasons. An area that is designed with the latest in modern furniture will make an impression on your clients, cultivate confidence in your team, and create a space that is both aesthetically pleasing and efficient. We provide a vast selection of new office furniture as well as used and pre-owned items for businesses across NJ, PA, and NY, as well as on a national basis, helping your business rise to the next level. Visit our showroom or call us today to inquire about current sales. Planning your office or executive room to reflect your goals and maximize your space efficiency is one of the most vital tasks your office furniture vendor can perform. We employ our design staff to ensure that your office is comfortable, efficient, and satisfies all applicable local and state codes. With many years of experience in the office furniture industry, our team will be able to assist in selecting the furniture that best meets the needs of your business’s environment. We make ordering simple. We process your order the same day and provide professional in-house delivery and installation services for our clients on a local and nationwide scale. Our services include delivery, placement, and adjustments of all products we sell. 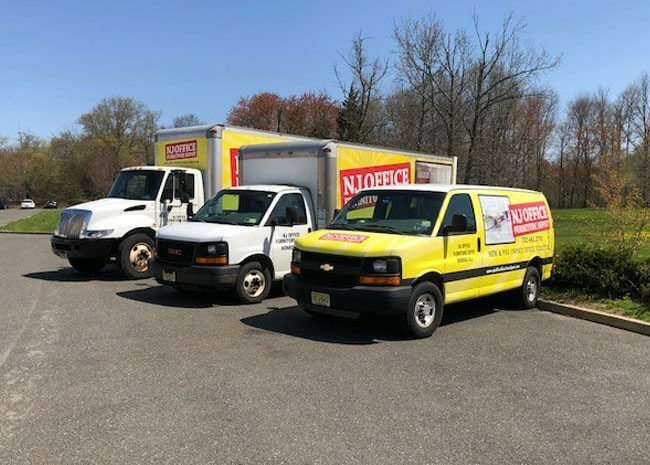 NJ Office Furniture Depot uses our own delivery and installation employees, as well as a team of seasoned installation contractors, to ensure that your products are delivered and installed right the first time. Let our office furniture company bring your business to the next level. Whether you’re renovating the executive office or revamping your cubicle arrangement, you’re sure to find what you need in our showroom. NJ Office Furniture Depot proudly serves local communities across NJ, NY, and PA, as well as across the country. Call us today to learn about our sales and find out what we can do for your business! *Our price guarantee does not apply to installation labor, competitors’ closeout, special orders, discontinued items, clearance, liquidation, or damaged items.